Hello Nosh Show listeners!! After making several 2015 predictions on Nerd Lunch Ep162, it's time to focus in on food predictions with Eric, Ryan, and Marvo. The funny thing is, after recording the episode, Nick showed me the photo below, and according to the source, at some point we will see Magnum Double Peanut Butter Bars (my review here) and Girl Scouts Thin Mint Frozen Dessert Bars here in the states. 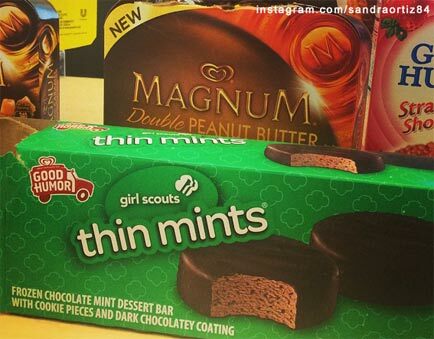 Nick can confirm the Magnum bars are already hitting shelves and JFG has a shot of the thin mint bars on shelves. Ok, so back to Episode 47, we do followup, a few Nosh or Nots, and then dive in to our thoughts for 2015. If you have some hopes (or just wishes) for 2015, please let us know in the comments. Ok, to my fellow Northeastern neighbors, be safe. To everyone else, have a good week! Dubba, I hope you and your family are safe as well. I thought you were someplace in New England? If your power goes out, remember, save the ice cream first! Well, after making sure you family is safe. You could probably store it outside till Spring in all that snow. Hope you're safe as well. Thought you might be in NY or NJ. If so, you dodged a bullet! Now get cracking on those Magnum Bars. @Anon: Thanks! Nick dodged the nasty stuff but we had two feet of the fluffiest snow I've ever seen, which thankfully translated to minimal power outages in Mass: The ice cream is safe!